We are all familiar with the Stations of the Cross (also known as the Via Crucis or the Way of the Cross), which have been part of the devotional practices of the Church for many hundreds of years. Traditionally the fourteen Stations of the Cross have been prayed on Fridays during Lent, on the other weekdays of Holy Week, and on Good Friday. Those of you who have traveled as pilgrims to Jerusalem have likely walked and prayed the Stations of the Cross, known as the “via dolorosa” (way of sorrow), in the footsteps of Jesus as he made the agonizing journey to his crucifixion on Golgotha. Inspired by an ancient inscription found on a wall of the San Callisto Catacombs on the Appian Way in Rome, a Salesian priest named Father Sabino helped develop the idea to create a set of Stations of the Resurrection in the 1990s. The new stations combine the events mentioned in the Saint Callistus inscription with other post-Resurrection events to create 14 stations, thus paralleling the Stations of the Cross and juxtaposing the Via Lucis (Way of Light) to the Via Crucis. 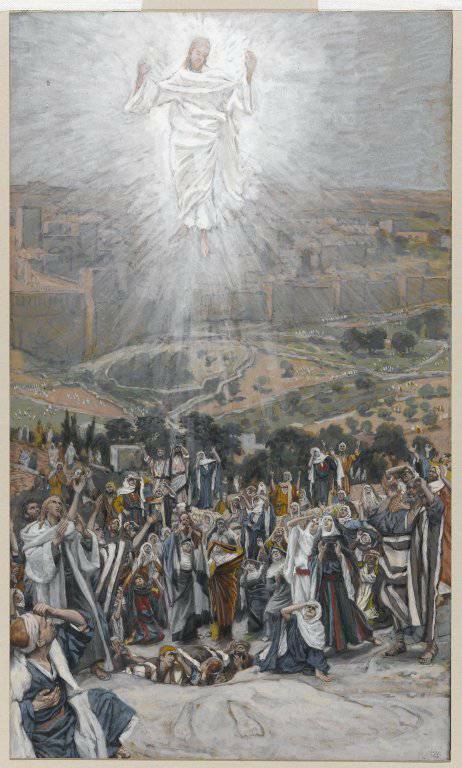 The fourteen Stations of the Resurrection begin with the appearance of the Risen Lord and end with Pentecost. The Via Lucis is particularly suited for Easter Sunday, for the weekdays of the Easter Octave, and throughout the fifty days of the Easter Season. The Stations of the Resurrection emphasize the hopeful aspect of the Christian story and (just as the Stations of the Cross help deepen our Lenten experience) can serve to deepen our appreciation of this Easter Season. Often, we are so focused on the observances and practices of the forty days of Lent that we often neglect the fifty days of the Easter Season. For many Catholics (and Christians of other denominations), Easter Sunday is both the beginning and end of Easter. The Stations of the Resurrection help us remember that we are Easter people of the Resurrection! Over death today rose triumphing, Alleluia! 'For we have grown into union with Christ through a death like His, we shall also be united with Him in the resurrection....If, then, we have died with Christ, we believe that we shall live with Him....Consequently, you too must think of yourselves as being dead to sin and living for God in Christ Jesus: (Romans 6: 5, 7, 11). Let us walk this pilgrimage of faith, the Via Lucis, as daughters and sons of the light and as witnesses of the Risen Lord. Let us meditate upon the resurrection of Christ and discover the pathway of light that Christ blazes through our lives. On the first day of the week, at the dawning of the new creation, Jesus arose from the dead. No one saw the event, yet like the apostles, we are called to be witnesses of this central faith event. The light and power of Christ's death and resurrection has become the pattern for our living. May we recognize Christ's dying and rising in our midst. This is the day, Lord God, that You have made! Raising Christ from the dead, and raising us with Christ, You have fashioned for Yourself a new people. As we hear the word that brings salvation, make our hearts burn within us. Through the presence of every friend and stranger, reveal to us the face of the One who had first to suffer, but who has entered now into glory, Jesus Christ, our Passover and our Peace, living and reigning with You, forever and ever. Amen. To seek the tomb where Jesus lay, Alleluia! 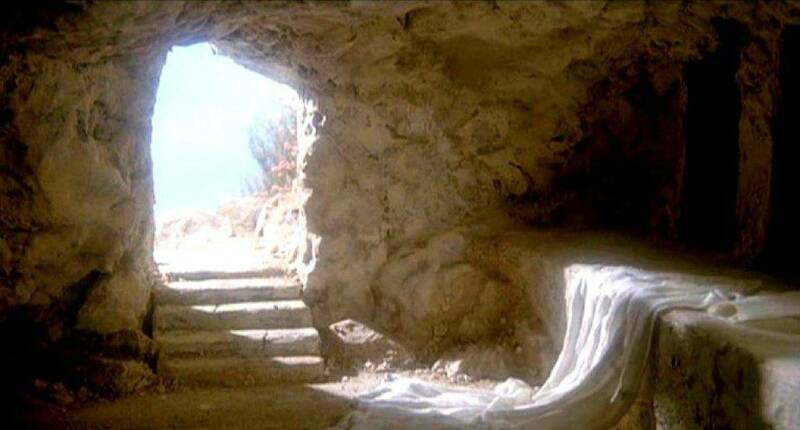 Reading: "Then the other disciple also went in, the one who had arrived at the tomb first, and he saw and believed"
God our Father, creator of all, today is the day of overwhelming joy. 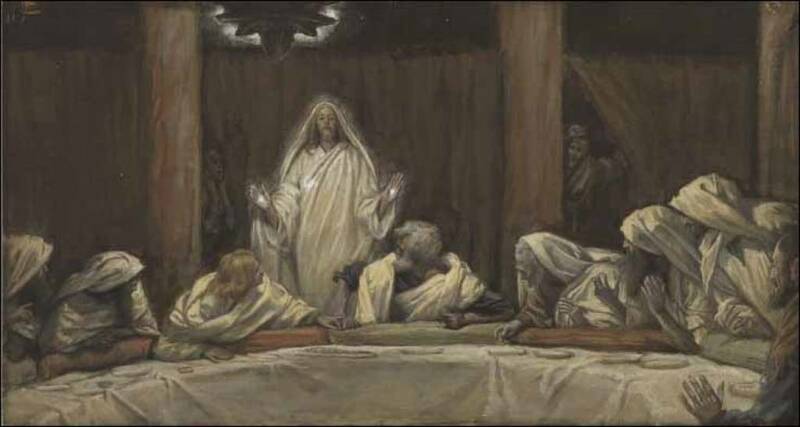 The Lord appeared to those who had begun to lose hope and opened their eyes to what the Scriptures foretold: that first He must die and then rise. May the Risen Lord breathe on our minds and open our eyes that we may know Him in the breaking of bread, and follow Him in His risen life. Grant this through Christ our Lord. Amen. 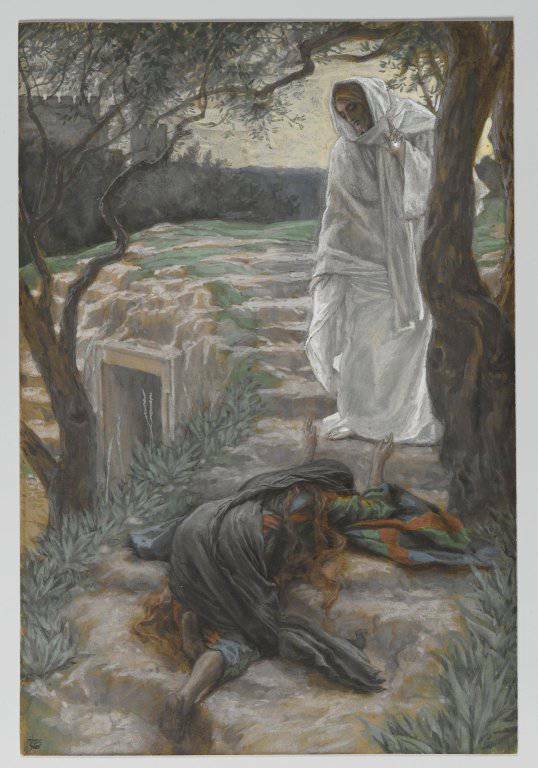 Arriving first before the tomb. Alleluia. "She turned around and saw Jesus there, but did not know it was Jesus. Jesus said to her, 'Woman, why are you weeping? Whom are you looking for?' She thought He was the gardener and said to Him, 'Sir, if you carried Him away, tell me where you laid Him, and I will take Him.' Jesus said to her, 'Mary!" She turned and said to Him in Hebrew, 'Rabbouni,' which means Teacher. 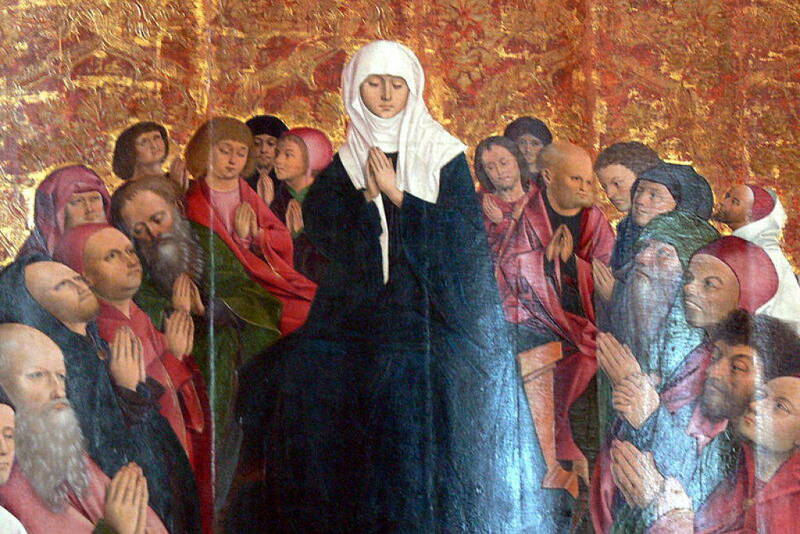 Jesus said to her, 'Stop holding on to Me, for I have not yet ascended to the Father. But go to My brothers and tell them, 'I am going to My Father and your Father, to My God and your God.' 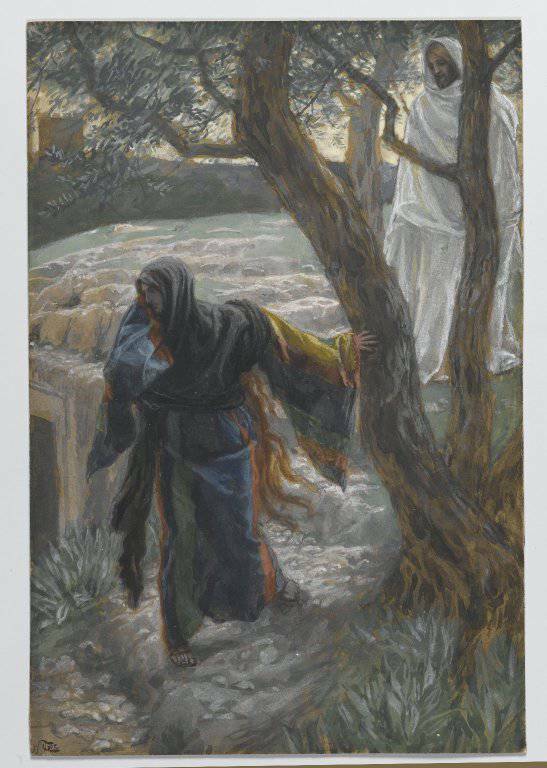 Mary of Magdala went and announced to the disciples, 'I have seen the Lord,' and what He told her" (John 20: 14b-18). God our Father, You will that all people to be saved and come to the knowledge of Your truth. Send workers into Your great harvest that the Gospel may be preached to every creature. May Your people, gathered together by the word of life and strengthened by the power of the sacraments, advance in the way of salvation. We ask this through Christ our Lord. Amen. Embalming Jesus' corpse that day. Alleluia. 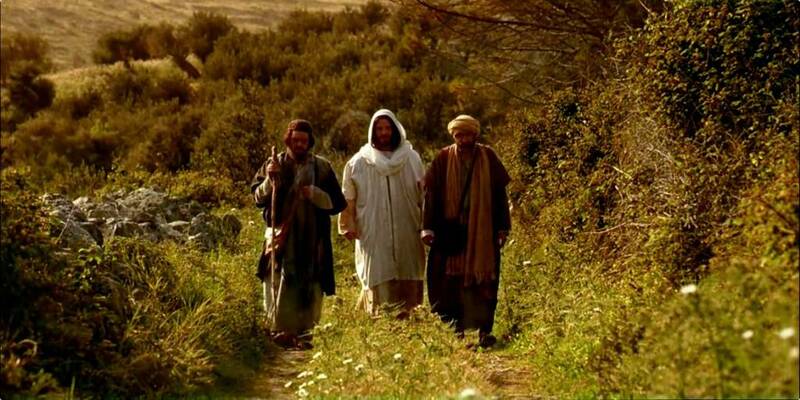 Lord God, as disciples on our pilgrimage, we implore Jesus Christ: stay with us, Lord. Open our hearts to true conversion and, as we have known the Lord in the breaking of the bread, so make us witnesses of a new humanity, renewed, reconciled and at peace in Your love. Send us as heralds of the repentance and forgiveness You offer to all in the name of Jesus, who lives and reigns with You, forever and ever. Amen. And said My peace be on all here. Alleluia.
" ...They urged Him, 'Stay with us, for it is nearly evening and the day is almost over.' So He went in to stay with them. 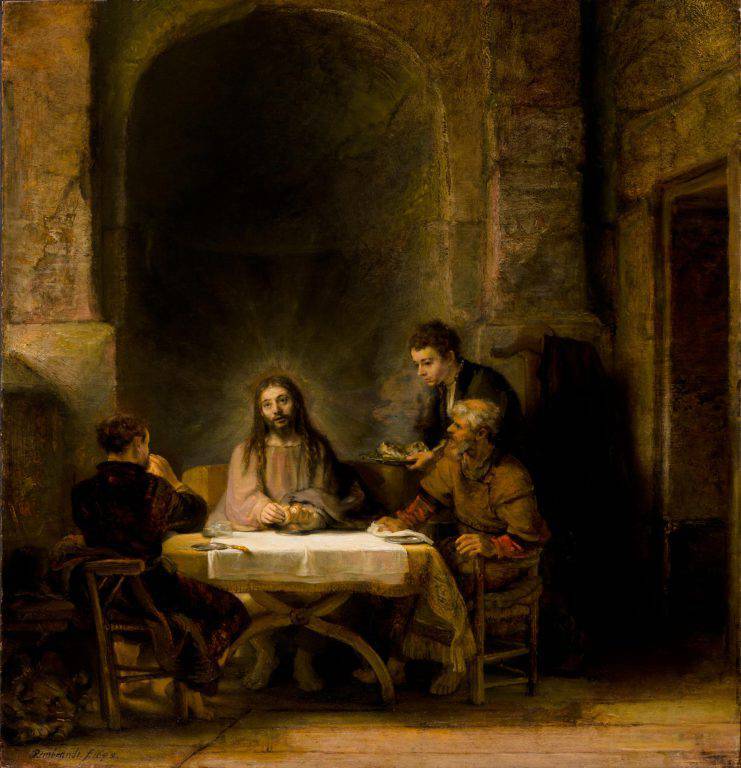 And it happened that while He was with them at table, He took bread, said the blessing, broke it, and gave it to them. With that, their eyes were opened and they recognized Him, but He vanished from their sight. 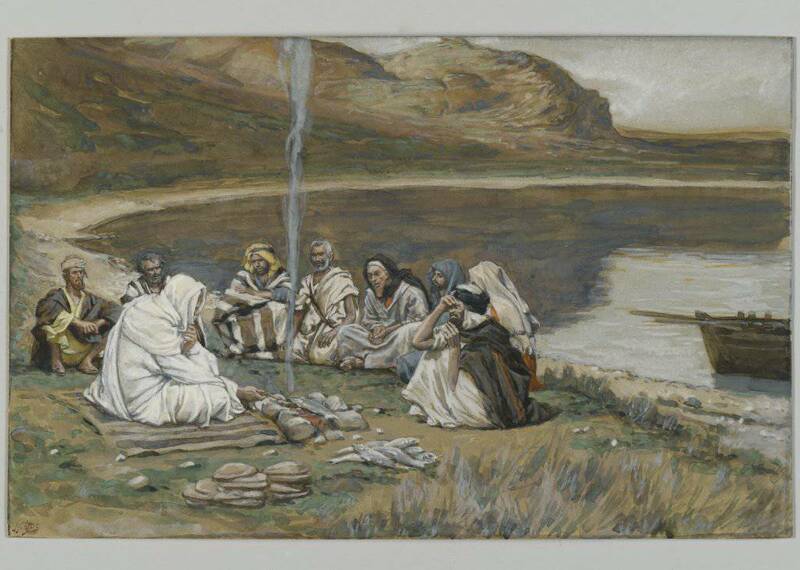 Then they said to each other, 'Were not our hearts burning within us while He spoke to us on the way and opened the scriptures to us'" (Luke 24: 29-32). You are truly blessed, O God of holiness: You accompany us with love as we journey through life. Blessed too, is Your Son, Jesus Christ, who is present among us, and whose love gathers us together. As once He did for His disciples, Christ now opens the Scriptures for us and breaks the bread. May the Eucharist we celebrate guide us to the fullness of Christ's life. We pray in the power of Christ's Spirit, forever and ever. Amen. He doubted the disciples' word. Alleluia. God of unchanging power and light, look with favor and mercy on the entire community of Your Church. Bring lasting salvation to the human family, so that the world may see the fallen lifted up, the old made new, and all things brought to perfection, through Him who is our origin, our Lord Jesus Christ who lives and reigns forever and ever. Amen. Not faithless, but believing be. Alleluia. Jesus came and stood in their midst and said to them, 'Peace be with you'... 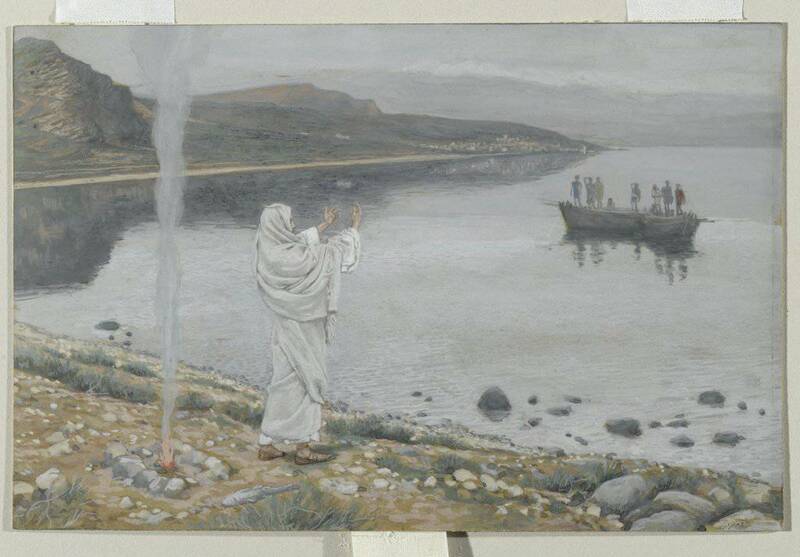 The disciples rejoiced when they saw the Lord. Jesus said to them again, 'Peace be with you. As the Father has sent Me, so I send you.' And when He had said this, He breathed on them and said to them, 'Receive the Holy Spirit. Whose sins you forgive are forgiven them, and whose sins you retain are retained'" (John 20: 19b, 20b-23). God of perfect peace, violence and cruelty can have no part of You. May those who are at peace with one another hold fast to the good will that unites them; may those who are enemies forget their hatred and be healed. We ask this through Christ our Lord. Amen. You are my Lord and God, he cried, Alleluia! 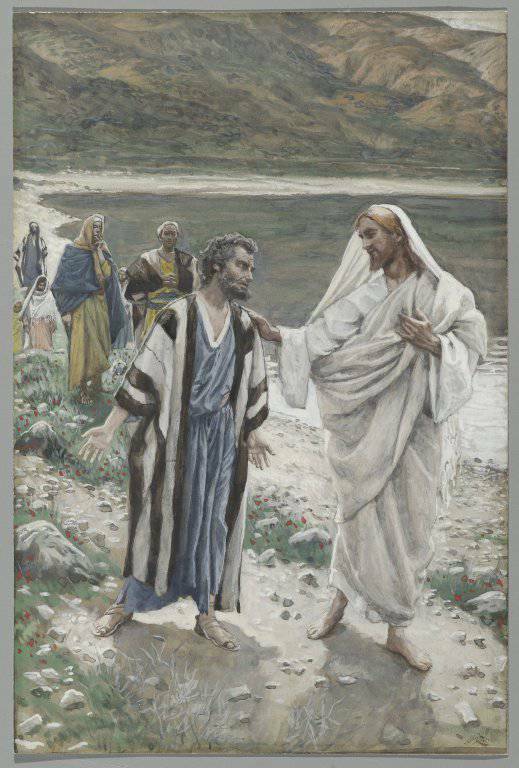 "Thomas…was not with them when Jesus came.... Thomas said, 'Unless I see the mark of the nails in His hands and put my finger into the nail marks and put my hand into His side, I will not believe'...Jesus came...and stood in their midst and said, 'Peace be with you.' Then He said to Thomas, 'Put your finger here and see My hands, and bring your hand and put it into My side, and do not be unbelieving, but believe'…Blessed are those who do not see and yet believe." (John 20: 24-29). The story of Thomas is important because it is through Thomas' example that we realize that doubt can be a part of faith. 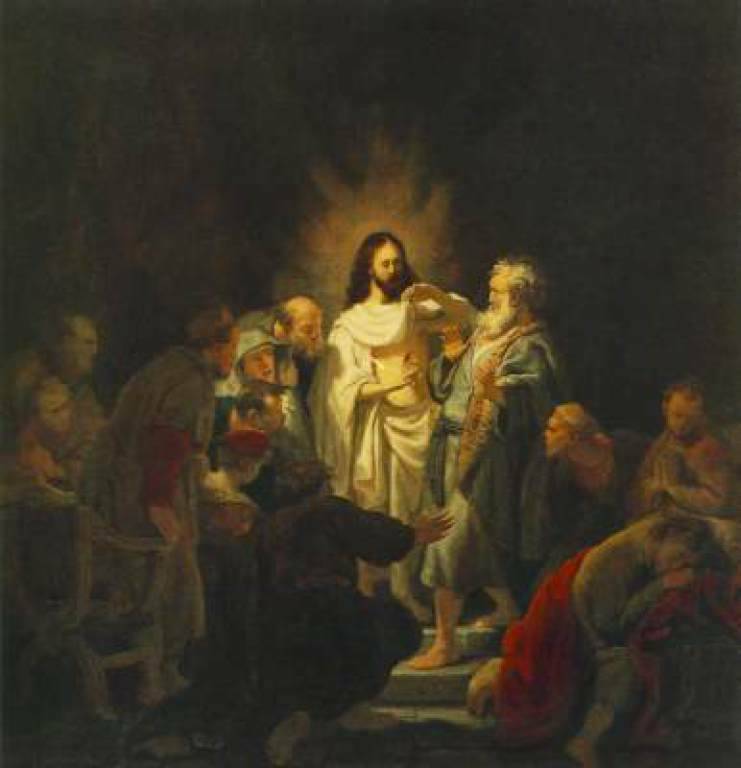 Too easily we call him "Doubting Thomas," and forgetting that after examining the nail marks, he fully embraced the Risen One as his Lord and Savior. 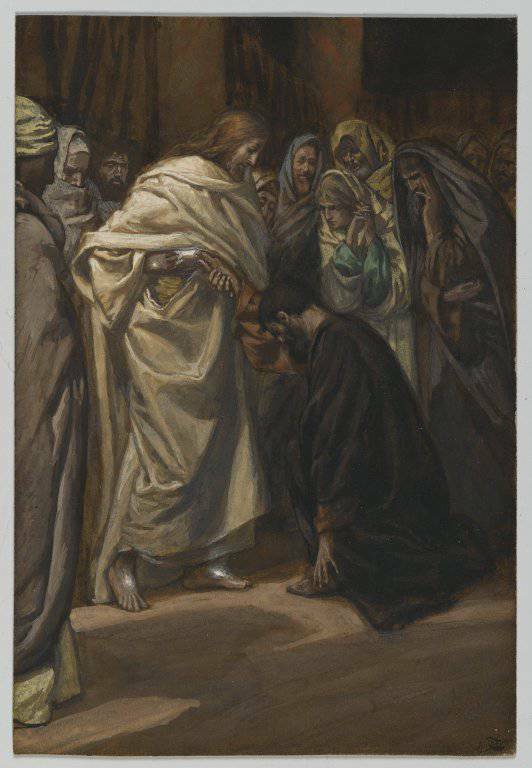 Thomas' doubt was transformed into a lively faith. We too, are called to believe, knowing full well that our faith may be tested by doubt and fear. As disciples who desire an ever-deeper faith, we are patient and understanding with those who are struggling, searching and seeking like Thomas. 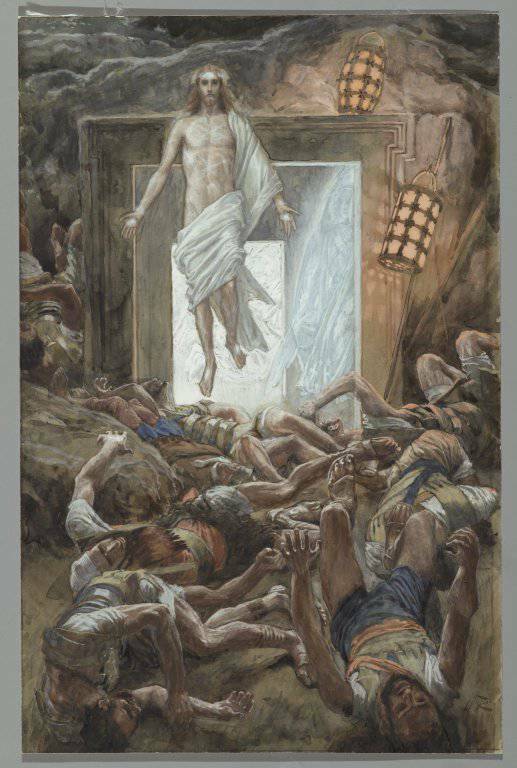 Heavenly Father and God of mercy, we no longer look for Jesus among the dead, for He is alive and has become the Lord of life. From the waters of death You raise us up with Him and renew Your gift of life within us. Increase in our minds and hearts the risen life we share with Christ and help us to grow as Your people toward the fullness of eternal life with You. We ask this through Christ our Lord. Amen. Father in heaven, author of all truth, a people once in darkness has listened to Your Word and followed Your Son as He rose from the tomb. Hear the prayer of this newborn people and strengthen Your Church to answer Your call. May we rise and come forth into the light of day to stand in Your presence until eternity dawns. We ask this through Christ our Lord. Amen. To see the tomb where Jesus lay. Alleluia. 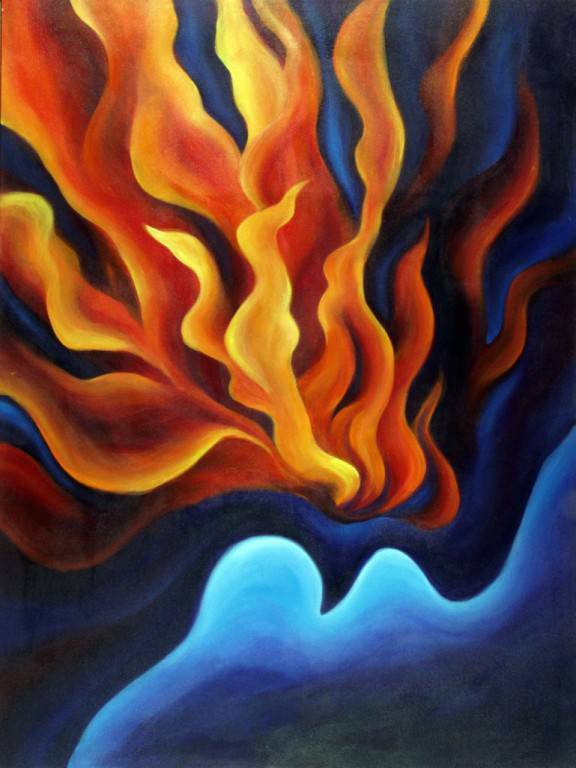 Father, fill our hearts with the fire of Your love and the desire to ensure justice for our brothers and sisters. By sharing the good things You give us, may we secure justice and equality for every human being, an end to all division, and a human society built on love and peace. Grant this through Christ our Lord. "'Go therefore, and make disciples of all the nations, baptizing them in the name of the Father, and of the Son, and of the Holy Spirit, teaching them to observe all that I have commanded you. 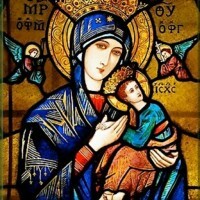 And behold, I am with you always, until the end of the age'" (Matthew 28: 19-20). From the mountaintop, the Risen Lord gives the "Great Commission" to the disciples to reach out to the ends of the earth. 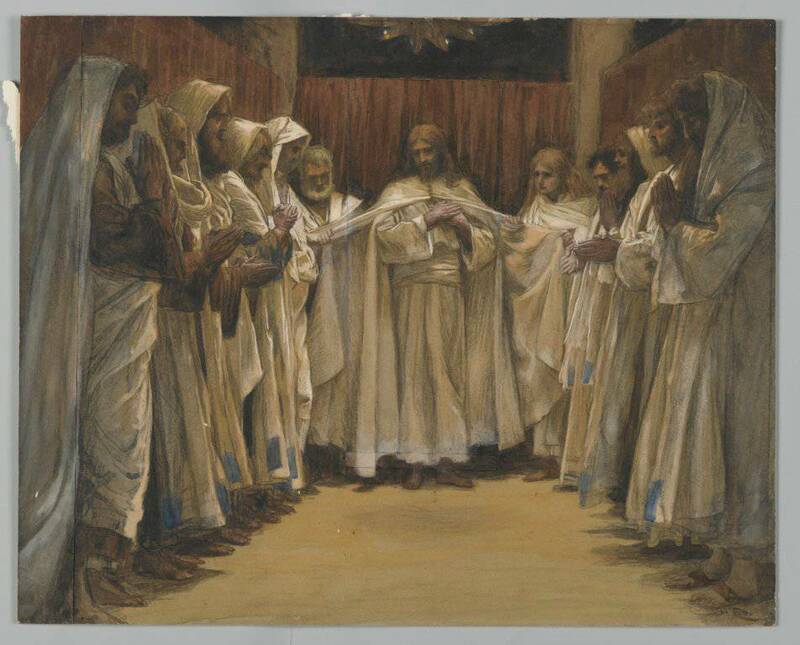 We realize that we are the recipients of this faith-filled mission: our ancestors embraced the faith of the apostles, who were the original witnesses of the resurrection. The greatest response we can give to such a legacy is our dedication to a new evangelization of our contemporary culture. We must allow the Risen Lord to reinvigorate our whole way of living, helping us to re-evaluate every aspect of our lives with the values of the Kingdom of God. God of all creation, whose mighty power raised Jesus from the dead, be present to this community of disciples whom You have called to the hope of a glorious inheritance among the saints. Strengthen us in the power of the Spirit to go and make disciples of all nations, to obey everything that Jesus Christ has commanded us, and to know that He is with us always until the end of the age, interceding on our behalf, living and reigning with You in the power of the Holy Spirit, now and forevermore. Amen. in glory to the King of light. Alleluia. Eternal God, clothe us now with Your power. With the eyes of our hearts enlightened, may we come to understand the immeasurable greatness of Your power at work in us who believe. In that strength, may we boldly pronounce the Good News of our salvation to everyone. We ask this through Christ our Lord. Amen. For Paschal blessings here below. Alleluia. Father most holy, see Your Church gathered here in prayerful worship like the first disciples and Mary in the Upper Room. 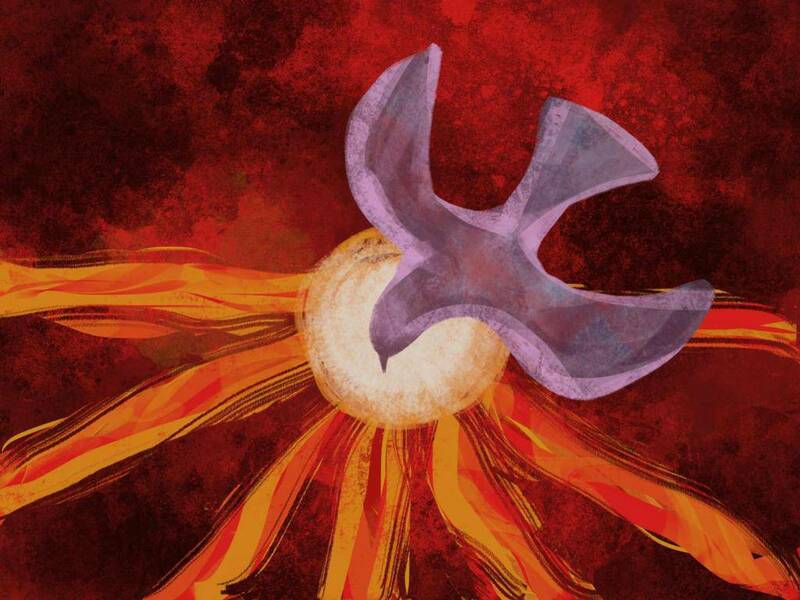 Grant that we may accomplish, in the joy of the Holy Spirit, all that You give us to do in the world. May we gladly share in Christ's sufferings so as to rejoice when His glory is revealed. We ask this through Christ our Lord. Amen. In laud and jubilee and praise. Alleluia! Father in heaven, through this spiritual journey, You have reminded us of the fullness of the mystery of Your revealed love. See Your people gathered in prayer, open to receive the Spirit's flame. May it come to rest in our hearts and disperse the divisions of word and tongue. With one voice and one song, may we praise Your name in joy and thanksgiving. Grant this through Christ our Lord, and in the power of the Spirit, both now and forevermore. Amen. From death to life has been restored. Alleluia. Reading: " ... Jesus Himself, through them, sent forth from east to west the sacred and imperishable proclamation of eternal salvation. Amen" (Mark 16:8, the Shorter Ending). Lord, may everything we do, begin with Your inspiration, continue with Your help, and reach perfection under Your guidance. We ask this through Christ, our Risen Lord. Amen.